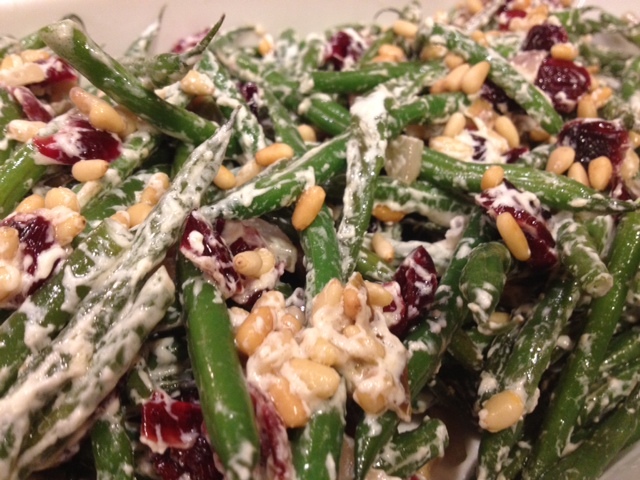 Roasted Green Beans With Goat Cheese, Dried Cranberries, Shallots & Pine Nuts. These green beans are super delish. I threw a few of my favorite things together and this was the end result. They are the perfect combination of sweet, salty, crunchy and tangy and would make the perfect side dish to any meal. In a large roasting pan, add the green beans and shallots. Drizzle about 2 tbsp of olive oil over top and season with salt/black pepper. Toss to combine. Cook in a 375 degree oven for 30 minutes, then mix in the cranberries and pine nuts with the beans. Cook for an additional 10 minutes. After you remove from the oven, immediately add in the goat cheese to the green beans in the roasting pan so the heat melts the cheese. Toss the green beans until all of the ingredients are coated in the cheese. ← Gluten-Free Lemon Vanilla Cake.